All transactions are safe and secure with a reliable history in online purchasing behind each of our associates. 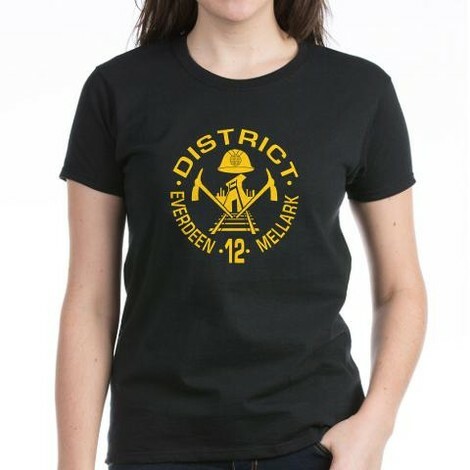 Buy the Hunger Games District 12 Tribute t-shirt to own Hunger Games clothing and merchandise. Let everyone know that you are a District 12 tribute like Katniss Everdeen and Peeta Mellark. Those who hail from District 12 work as coal miners for the Capitol. Mercantile families in the district live in the town, while the other poorer families live in the Seam, which is an overcrowded, impoverished slum. Tributes from twelve have only been victorious in the Games three different times, including the 50th Games, also known as the second Quarter Quell. Get your District 12 Tribute shirt and make your community proud. In addition to the Hunger Games District 12 Tribute tee above, browse the Hunger Games Clothing Gallery for more apparel like men's and women's clothes, kids shirts or hoodies.